2009 Local Talkers Fourth Quarter Group! Oh my, the final fourteen weeks of the 2009 Local Talkers project were wild! There was the woman half hiding behind a wall and the guy with the sunglasses and face mask. Unbelievable!!! If I were making up a face a week, I would never have gotten as out there as these real life respondents to the Good Times Local Talk column did. And that is the nutshell reason I even attempted this: Truth adds more unanticipated detail and surprise augmentation than Fiction. One almost just needs to provide a well-orchestrated capturing mechanism, whether it is the photograph, videocamera, written word, painted impression, or in my case, the small handformed face jug. Almost. I know my Genius walks the streets, though. This was the last sub-group to be formed and successfully bisque-fired. It is delicious to have gotten to this point, so let’s take a moment to gaze at the first collective shot of them all. I have taken a few stabs at this unifying need over the past year, but now I am calling in some experts. 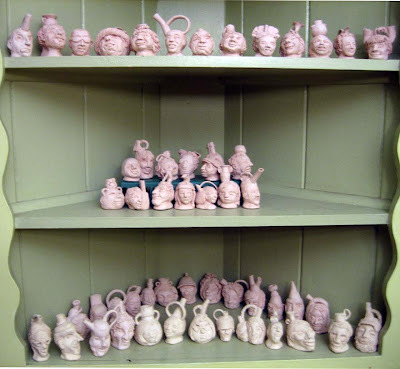 I have a set of fellow ceramic artists whose aesthetic senses I revere who I will consult. I will do a lot of testing. I will take it slow. Maybe I first need to be clear on how I will display them before I know how to unify the decorating. One long shelf? Four shelves? Individual shadowbox cubbies? Risers? Wall? Table/pedestal? Frontal? 3D? Pyramid? Wood? Black velvet? Bamboo? I am in another Gathering Phase of the Creative Process. I did not work this hard for more than a year to rush through, either. I am savoring this part: letting the right surface treatment present itself as I run my options. 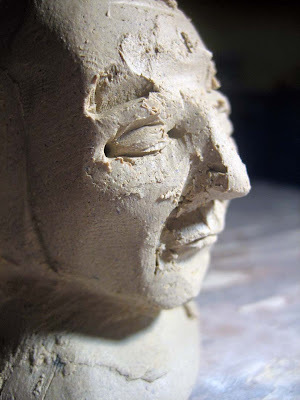 I know I will feel its goodness when it arrives, just like I let the right face come to me each week and I let my formal response to it come around as I worked the clay. It’s that well-orchestrated capturing mechanism being developed, spliced, edited, restated and glazed in order to turn it into art and I am good for the breadth and the distance. 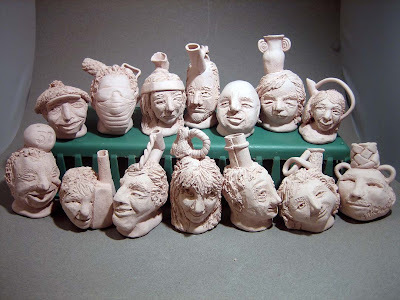 I want to walk you through making one small face jug, which, times 53, comprises what I have been doing all of 2009 in my Local Talkers series. Each one is unique, but there is a unifying rhythm to making them and it goes like this. 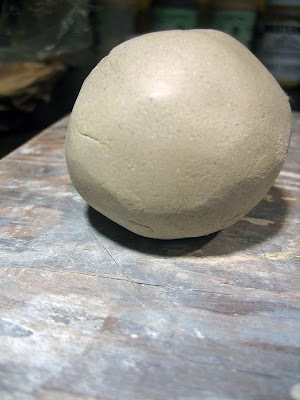 Nearly every one starts out as a hand pinched and closed sphere about 2-3 inches across. I can barely explain how I choose The Subject Face from the 4 or 5 in each week’s column, and I have been known to drift from one face to another mid-making. I look for some expression or attribute that intrigues or amuses me. I am not making a portrait so much as an echo or an interpretation. Sometimes I read the names, occupations and responses, mostly I do not until after I have chosen and started in. One thing in David Baker’s favor was I had not had anyone in a headband all year and his face is elongated with that great center part in his hair. 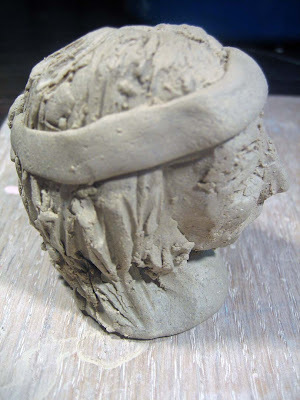 I started by paddling the sphere into a long capsule, then pinched it to form a base, neck, chin and that scalp part, as you can see. To my artist’s brain, it’s exactly like a rough sketch in charcoal. Add in a tiny bit of pressure to work while the clay is at an ideal wetness at every stage — although even that can be controlled. (I could work for months and years on this if I needed to.) I want it done in a few days and will control the drying with brushed/sprayed on water and plastic. I am pleased with this profile and demeanor. It has a classic feel: Egyptian? George Washington? Next comes details and rough hair. 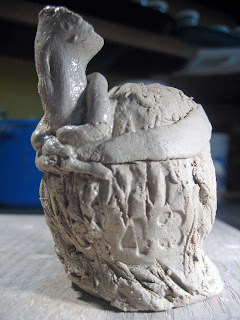 The clay’s perfectly malleable but too sticky to finalize things, so I am relaxed about burrs and fingerprints. All in good time. I have delineated the headband position before I commit to much more hair. Oh, and I have made peace with a certain androgynous quality I find in nearly every face. 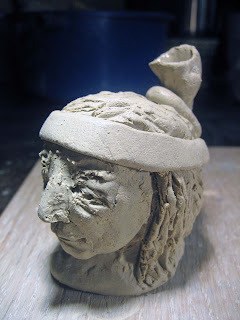 Now the headband is on and I am starting to think about where I will add on a spout, perhaps a handle and other decoration and where exactly I will press on this week’s number. All those additions need to be in place before final touches, otherwise I will be fighting with myself and my tools. I want something rather organic and abstract for a spout, suggestive of a feather or an antler, but not actually recognizable. Not sure about a handle…there’s plenty going on with the knot in the headband. And here’s what arose in response: An open-ended spout-structure, surrounded by another supporting loop and a pressed-in 43 in the hair. The newer additions glisten due to the clear water brushed on to both help attach them and to provide a unified smoother surface. One more shot from the front. Is that a pipe? A blossom? I am glad it is not specific! And I like that it is subtly resting in back, not taking anything away from the face in shape, subject or placement. And that’s that for now. It’s too wet to attempt much more today on it. It is good to wrap it up in plastic and let it sit at least overnight, exchanging moisture levels, drying slightly on the outside and letting me see it anew on the morrow. If things go at all like they have with countless other small face jugs, when I work on this piece again I will need to restate hair and refine facial lines, “disappear” some seam lines and edges, clean up those burrs and fingerprints, and maybe even patch a crack or a thin spot. Once that is done, I will make sure the piece sits level, sign and date the bottom and begin drying it ever so slowly, gradually loosening and removing the plastic, for the next week or so, until it is bone dry and ready for the bisque firing. 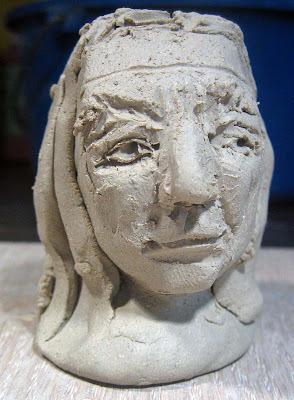 I have said to countless people over the years that clay taught me patience and I can see once again how true that is in describing what I do without thinking for one small face jug. 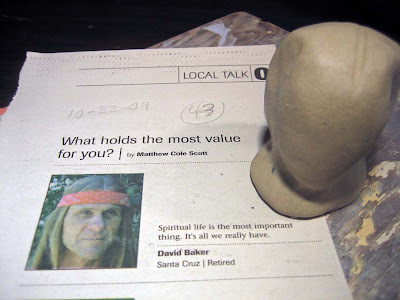 Times that by 53 and I see I am really working on Mount Rushless, and I guess I can claim some sort of bonafide Clay Abiding Award, knowing as I do, when to hold ’em and when to fold ’em.